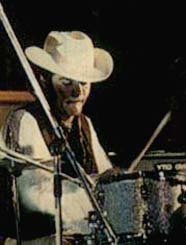 A drummer active on the Hull scene from the mid-1960s onward, John Cambridge moved between a number of bands during this time period, beginning in 1965 with the Mick Wayne-led combo The Hullaballos and followed by short stints in Gonx and ABC. In 1967 he joined The Rats, an outfit that also included a talented young guitarist named Mick Ronson. Near the end of the year The Rats recorded the LP The Rise and Fall of Bernie Gripplestone (whose title was derived from John Lennon’s character in the film How I Won the War) before making an unsuccessful attempt to establish themselves in London; the following year they changed their name to Treacle and recorded a few more tracks, but these would not see the light of day for another 30 years, when they were included as bonus tracks on the CD reissue of Bernie Gripplestone. At some point in 1969 Cambridge and Ronson began rehearsing with members of The Mandrakes, with the intention of creating a new group that was to be called Teeth. The project never left the ground due to personnel conflicts. Ronson subsequently resumed his position in The Rats, but Cambridge chose instead to once again throw his lot in with former bandleader Mick Wayne, taking the drumseat for Wayne’s new band Junior’s Eyes. Their sole album Battersea Power Station appeared that same year, but it was their contribution to David Bowie’s eponymous 1969 release (issued in the States as Man of Words/Man of Music, and later reissued worldwide as Space Oddity) and their role as his backing band for live performances that brought Junior’s Eyes the most attention. After Junior’s Eyes dispersed, John Cambridge returned to Hull to enlist Mick Ronson in Bowie’s next backing band The Hype, which also included Bowie’s producer Tony Visconti on bass (who was already familiar with Ronson through sessions for Mike Chapman’s Fully Qualified Survivor album). This period marked the beginnings of Bowie’s more theatrically-oriented approach (fully realized two years later with The Rise and Fall of Ziggy Stardust and the Spiders from Mars), with each of the musicians assumed superhero alter-egos during performances (Cambridge’s identity and corresponding attire being that of “Cowboyman”). After only a month of activity, however, Cambridge left The Hype to join up with The Mandrakes. Not much is known of his subsequent activity, outside of a brief involvement in the tongue-in-cheek Marc Bolan outfit Dib Cochran & The Earwigs. Rick Wakeman was also involved in the short-lived group, which had Tony Visconti on bass and vocals, drummer John Cambridge (from the band Juniors Eyes) and a certain Marc Bolan on guitar. Dib Cochran & the Earwigs issued one single, ‘Oh Baby’, in September 1970, a month before T.Rex released ‘Ride a White Swan’. What if ‘Ride a White Swan had bombed? What if ‘Oh Baby’ had been the hit? The 1970s might have been a very different place!